Women's Safety in India has become a huge topic of discussion and concern, particularly amongst foreign female travelers visiting the country. Unfortunately, lack of awareness and understanding of Indian culture often unwittingly makes foreign women a target of sexual harassment. This book focuses on education about Indian culture and the prevention of cultural mistakes. It's an informative and invaluable resource that all foreign women coming to India should read. The book's author, J D Viharini, is a single American woman who's been living in India for more than eight years. She first visited India in 1980 and since then has traveled extensively throughout most of the country by herself, using all modes and classes of transportation (from "Ritz to the pits", as she says). Hence, her experience places her in an excellent and authoritative position to write a book about women's safety in India. Not only does she know what it's like to travel solo all over India as a foreign woman, she's developed great insight into Indian culture and how the country functions at all levels. This is evident from reading her popular blog. She's also written a cultural handbook for visitors to India, which has been well received. 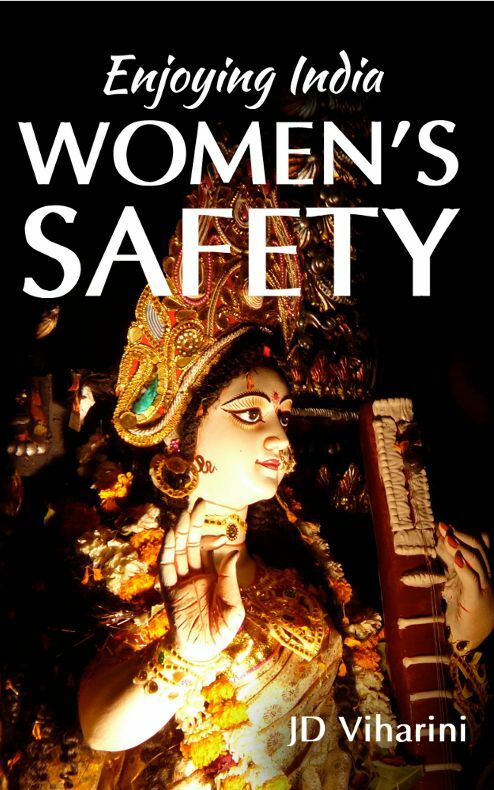 Enjoying India: Women’s Safety has 80 pages. It starts off with a chapter titled "About Indian Men", which discusses the general mindset of Indian men and how they conduct themselves. It highlights the issue of the very different cultural context in India compared to less conservative parts of the world, which travelers need to be aware of and adjust their behavior to accordingly. This includes standards of dress and interaction between the sexes. It also mentions the sense of entitlement that many Indian men have to do whatever they like with women, and the promiscuous way that foreign women are portrayed in the media. The book continues with chapters on the nuances of Indian culture (including honor and respect), the essentials of safety and prevention in India (including many important tips on how to act and interact), and what to wear. Interestingly, the author states that while researching the book, she "spoke with many women about their experiences with Indian men. Those who did not respect the Indian standards of dress almost invariably reported far more problems with harassment." The book also contains chapters on what to do when you first arrive in India, the types of places you should and shouldn't stay in, concept of privacy in India, sexual issues, and what to do if you're sexually harassed. The advice on dealing with harassment is especially useful because the fact is that many foreign women simply don't know how to respond to sexual harassment from men in India. They will often be shocked, ignore it, or treat it lightly and laugh it off. Speaking from experience, this is definitely not the best way to handle it though, and the book confirms this. Indian men do not expect a lot of resistance and will tend to target women who look helpless. Women's safety is a sensitive topic, and I expect that some people might like to label the book's advice as victim blaming. However, as the author says, "Dressing and acting modestly according to the culture does not inherently reinforce the idea that victims are to blame. Those who think it does simply don’t understand the culture." Many foreign women who come to India don't see the need to dress conservatively, especially if they visit cosmopolitan cities and see Indian women wearing shorts, skirts, and sleeveless tops. Yet, as the book pertinently points out, this does not reflect the values of the much more conservative majority. And, ultimately, even if you don't interact with these men, they are present everywhere. People such as servants and drivers all typically come from traditional backgrounds. I found Enjoying India: Women’s Safety to be a remarkably comprehensive, sensible, and astute resource. It's packed full of perceptive information. Similar to the author, I've also lived in India for around eight years. I practice what the book advises, and I feel that it's covered everything I've learned during my time in India and is an accurate reflection of it. What's more, along with the author, I've been complimented by Indian men on a number of occasions for dressing appropriately -- so it definitely does get noticed! Enjoying India: Women’s Safety is available from Amazon in the US and Amazon in India. (Note that Travel Fearlessly in India: What Every Woman Should Know About Personal Safety is the Updated Version of the Book).